You can now enjoy Sandakan at your own pace. 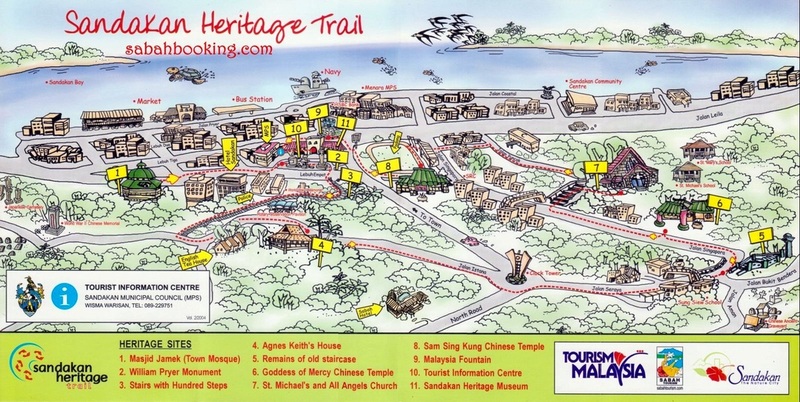 The Sandakan Heritage Trail is a comprehensive walk that covers the town's important and interesting sites which have contributed to her rich historical past. A leaflet will map out the entire trail for you and it covers about fifteen spots. These include the 100-year old Masjid Jamek, the Pryer Memorial, a granite structure erected to honour the founder of Sandakan, William B. Pryer, the Tourist Information Centre, the World War II memorial and much more. Climbing the Stairs with a Hundred Steps will lead you to a beautiful view of Sandakan town and bay. It also brings you to the Agnes Keith House. From restored colonial buildings like the Agnes Keith's House and the English Tea House, to places of worship - St. Michael's and All Angels Church, Sam Sing Kung (Three Saints) Temple and Goddess of Mercy Temple, this one hour walk takes you back to over 100 years. This former British colonial government quarters, called Newlands, was once occupied by famous American writer, Agnes Newton Keith, who penned 'Land Below The Wind' in 1939. Two books followed her first success, 'Three Came Home' (1946) and 'White Man Returns' (1951). With the exception of her second book, 'Land Below The Wind' and 'White Man Returns' were written in the house on the hill where she had the best views of Sandakan Bay at the front and the Sulu Sea at the back. Today the house has been restored and turned into a heritage house by Sabah Museum, in collaboration with the Federal Department of Museums and Antiquities. It provides interesting insights to life during British North Borneo and is furnished with a reproduction of colonial furniture and antiques. A gallery on the first floor tells the story of this remarkable woman, her books and her family. A Keith time-line starts in 1873 and ends in 2004 tracing the past to the present Keith’s. The Sepilok Orangutan Rehabilitation Centre was established in 1964 to return orphaned "apes back to the wild. The centre was being administered by the wildlife section of the Forestry Department which in 1988 was upgraded as a department under the Ministry of Tourism and Environmental Development. All administration and management was given to the new Wildlife Department of Sabah. Puu Jih Shih Temple is one of the famous temple in Sandakan. Tribute to its location at the hilltop of Tanah Merah, many come here to have breathtaking panoramic view of Sandakan town and the harbour apart from religious duties. Quoted from source, this temple was built in 1987 which cost around US$ 2 millions. (That's huge sum of money at that era). The temple is in blaze of red and gold with writhing dragons, gilded Buddhas and hundreds of gleaming lamps. It is one of the oldest building in Sandakan dated more than 100 years and had survived from WW II in 1940. In fact, it's first construction began in 1893 and took almost 30 years to complete. The designer was Mr B. W. Mountfort. St. Michael’s and All Angels Church was one of Sabah’s few surviving pre-warstone building and was recognized as one of the world’s heritage since 2005. The beautiful stained glass windows in the church were donated by Australians to commemorate the 60th anniversary of the end of World War II. The Sandakan Crocodile Farm is Malaysia's largest with over 3000 of the reptiles. The original stock came from wild crocodiles found along the Kinabatangan River. The animals are farmed for their skins to be turned into shoes and bags. Besides offering visitors an up-close look at Sabah's biggest reptiles, the farm hosts several other attractions as well, including crocodile and snake shows. It also features a mini zoo with a 100kg Amazonian fish, and a children's park. The oldest, purpose-built hotel in Sandakan. Family run since 1966. Retains the old and embraces the new - a hotel brimming with cultural detail and interest. You walk into a hotel with recollections of a time past but with strokes of a contemporary touch. With the romantic BALIN roof garden bar & bistro now open on the roof top, 8th floor; see the entire stretch of old Sandakan town, the tranquil coastline and the Sandakan skies and sunset….soak in the authentic atmosphere of this small town from a beautiful vantage point. Sandakan Rainforest Park (SRFP) is located about 9 km away from the centre of the coastal town of Sandakan in Sabah, Malaysia. The Park, covering an area of 148.6 hectares, is situated at a site where some of the earliest botanical explorations in Borneo were carried out. The Park is the locality of about 110 type specimens; as such, it a very important site for research on plant diversity in Borneo. The core area of this Park is still in pristine condition. Many lowland species of flora and fauna of Borneo are found in this forest. Sandakan War Memorial or Sandakan Memorial Park is located in the outskirts of Sandakan, Sabah Borneo. The site is just next to the actual POW (Prisoners of War) camp which was set up during the World War Two Japanese Occupation from 1942 to 1945 which witnessed the death of 2400 Australian and British POW held by the Japanese here. This war memorial was officially opened on the 15th February 1999 and the memorial park is dedicated to the men who lost their lives in the Borneo Death Marches during the Second World War. Very nice and full of chinese buddha statues, with very well designed temple. The Turtle Island Park (gazetted 1977) lies 40km north of Sandakan in the Sulu Sea and consists of Selingan, Bakungan Kecil and Gulisan islands. The park is a safe haven for the endangered green and hawksbill turtles and gives you the rare opportunity to watch turtle landings. Selingan, the largest of the islands, houses the park's headquarters, a turtle hatchery, tourist accommodation and basic facilities. The other two islands are more for conservation activities. The boat from the Sabah Parks jetty at Jalan Buli Buli Sim leaves at 9.30am and the ride to Selingan takes an hour. For Foodies! Try Our Local Delicacies! There are a lot of local delights! If you never try them. You are never been to Sandakan!